If you are a lovely bride looking to find the perfect venue for your wedding, and you live in Fall River or the surrounding areas, you NO DOUBT will be visiting one of the above mentioned restaurant / banquet halls . Although there are a few other halls and restaurants that can take care of your wedding needs ...VENUS ...WHITE'S ....and MCGOVERN'S ....remain the "BIG DAY " triumvirate ( look it up ) . These large wedding facilities have each been around for decades ....and there's a reason for that ......excellent service ......beautiful surroundings .....and delicious food . All 3 will help your BIG DAY be your PERFECT day . You couldn't go wrong with any of them . 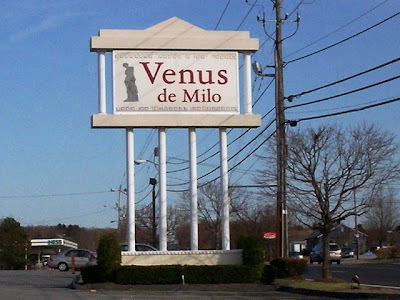 It was a Saturday (March 27th) when we decided to visit VENUS ....and from a previous experience ....we knew that they didn't open for dinner until 5:00pm. No problem .....we'd wait .....and we did ....in the parking lot ....for about 15 minutes . LOL Then we waited when trying to go into the restaurant at 5:00 and being told it would be another 15 minutes before we could be seated . We didn't know why but you should have seen the expressions on the faces of the people in front of us ......priceless . However we only had to wait a few minutes and were seated at a lovely table . VENUS is so elegant . White tablecloths everywhere .....lovely place settings ...fluted napkins ....and immaculate throughout . Picture perfect . As soon as we sat down we were brought glasses of iced water with lemon .....a rare touch these days . A very nice server (Tana) took our order for 2 - diet sodas and gave us the menus and described the night's specials . Everything sounded good . When she returned with our drinks we received a nice bread basket and some flavored oil ( both were very tasty )....and she took our orders . Laura ordered the stuffed scrod with Delmonico potatoes and fresh green beans and I ordered the baked scrod with crumb topping , a baked potato and some mixed veggies ......guess it was a fish kinda night . 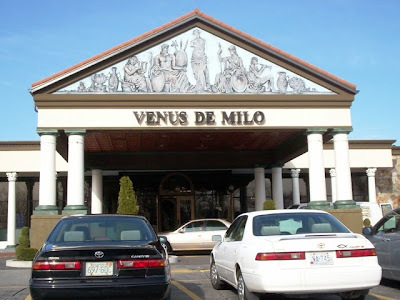 VENUS has all manner of seafood , steaks and pasta dishes but they are EXTREMELY famous for their BAKED STUFFED LOBSTER ......one of Chef EMERIL LAGASSE'S favorite dishes . And my own brother & sister-in-law come down from Connecticut OFTEN just to have this special treat . 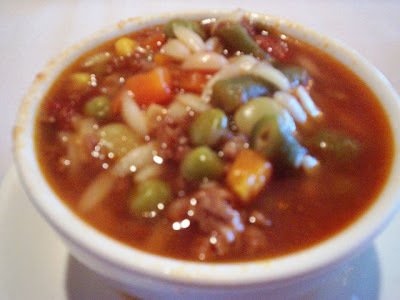 We both got a cup of VENUS'S FAMOUS minestrone soup . OMG ...this soup is soooooo tasty ....I wanted a bowl .....and could have gotten one ....but I knew my meal was still ahead . This soup is so popular that VENUS sells it canned in select markets in our area . YUM ! Our dinners arrived and they looked and smelled fantastic . 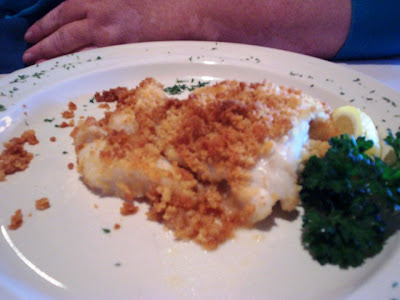 My scrod was perfection ....it couldn't have been done any better . It was white & flaky & tender & oh so good . Even the baked potato was excellent .....hot and so fluffy inside ....and it came with both butter & sour cream . I gave my veggies to Laura cause .....you know me and veggies . Laura had NO trouble focusing on her stuffed scrod ....she found it amazing . But the star of her meal was the delmonico potatoes . New to her .....she said they were almost like a potato pudding .....soft , creamy , cheesy , fluffy ......fantastic . She'd love to get them again ( this time I'm taking a bite ) . Her veggies were fresh and crisp. The portions were perfect .....we were satisfied ...without feeling over-stuffed and didn't want dessert ...even though some sounded really good . We took a quick visit to check out the ladies room and found it just as I expected .....pretty and immaculate . The prices are a little more expensive than we're used to ...but the food is also more fantastic than most . So it's well worth every penny . In fact ....we can't wait to go back .So ..KUDOS to VENUS ..... an.... A+++++ experience . We left $49 for Tana, which included a 20% tip. Venus de Milo is open for lunch from 11:30 a.m. to 2:30 p.m. Monday through Friday, and for dinner from 4:30-8:30 p.m. Monday through Thursday, 5-9:30 p.m. Friday and Saturday, and 11:30 a.m. to 8:30 p.m. on Sunday. 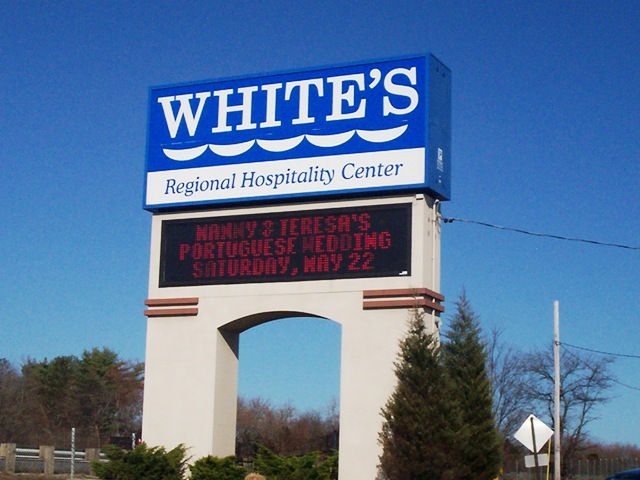 Round 2 of our fine-dining experience took us to White's, on Saturday, April 3. I had read on-line that they serve lunch every day from 11:30am. and I thought that meant in the main dining room ....The Priscilla Room ....and that we would have access to a full menu . But I was wrong I guess ( I have to check their site again ) . Because when we arrived at 4:00pm. ....we were led into The Galley Grille ( downstairs ) .....which I thought was for night-time dining ...like a more casual bar & grille . So we didn't have the luxury of a full dinner menu but were given the bar menu . But we were strong ......we made due . The room we were in was all wooden tables .....wide windows and a handsome bar .....very nice . We got a nice window seat and our efficient waitress (Jenny) took our drink order ....2 - diet sodas . She brought back menus & daily specials and a nice bread basket with flavored oil . 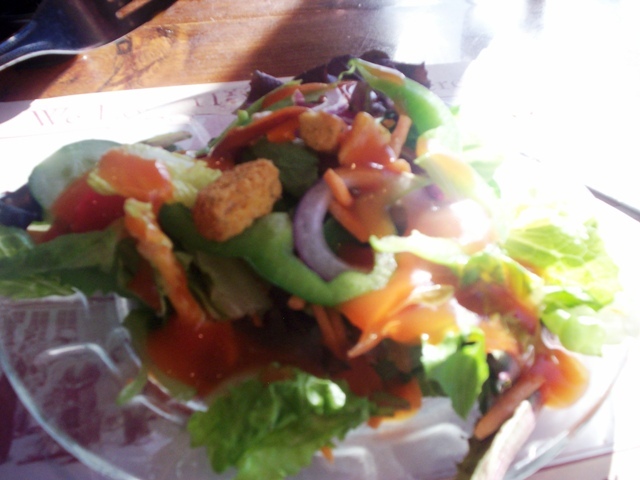 It was yummy . We had to get this appetizer .....just because of the name .....BAG O ' CAKES !!!! LOLOL Know what it was ??? A brown lunch sack with a half-dozen clam cakes ( or fritters for you not from this area ) . They were crisp outside and fluffy and filled with clams inside .....excellent cakes . And a great way to start our meal . After receiving our drinks , Laura ordered the mushroom raviolis and I ordered the salmon pie with fries and we both ordered a salad with French dressing . Sounded good . 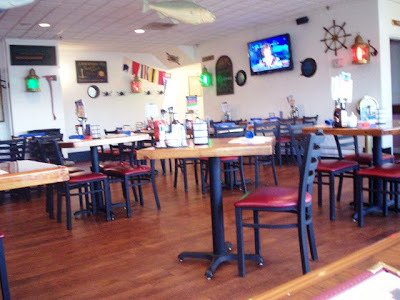 The bar menu had burgers & pizza & some seafood and pastas ...and I'm sure they were all good . But initially I had hoped to get a piece of WHITE'S famous French meat pie ...but it was not offered . Oh well. 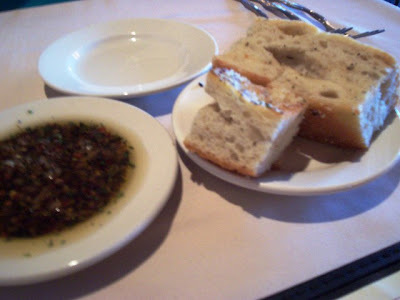 We ate our clam cakes , bread and salads and were just about expecting our meals when our waitress came over to inform me they had NO salmon pie ( maybe I wouldn't have gotten that meat pie either ) . Kinda a long time to tell me I'd have to choose something else . But I quickly chose the English - batter fish & chips and all was well with the world again . DON'T PUT THE FRIED FISH ON TOP OF THE PILE OF FRIES !!!!!! The oil from the fish ALWAYS makes those nice crispy fries soggy and inedible . Everything I liked about the fry is gone . PLEASE ....put the fish on the plate and the fries nearby ....Thank you . Rant over . My fish inside the crust was beautiful , white and flaky ....perfect . But I found the crust a little TOO fried . It was dark , a little greasy and toward the end I was pulling the fish out of the crust " cup " that was left on my plate . The deliciousness of the fish saved the dish . The portions were perfect and we were full enough that we didn't need dessert . Prices were a little on the steep side for what I considered bar or "comfort " foods but the food was really good . We'll definitely be back . On our way out we visited the ladies room and found it very clean and neat . Always a plus . We left $44 for Jenny, which included a 20% tip. 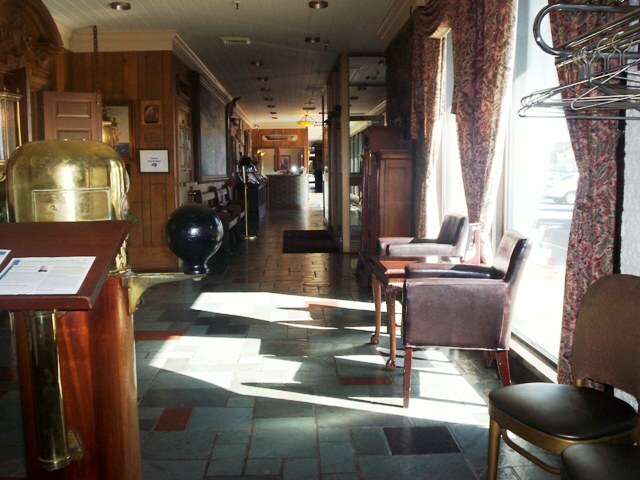 White's of Westport is open seven days a week serving lunch and dinner. Although Mom and I have been here for many different functions, and back in the dark ages Mom came here for dinner with Dad, I had never had an "official" meal at McGovern's, despite it being a Fall River institution. Mom decided that this place should be the first steppingstone to our "Tour of Fall River," where we plan to highlight (weekly) some of the most recommended restaurants in our beloved city. I couldn't wait to go! We pulled into the tight parking lot and got a spot pretty close to the door (always a bonus). 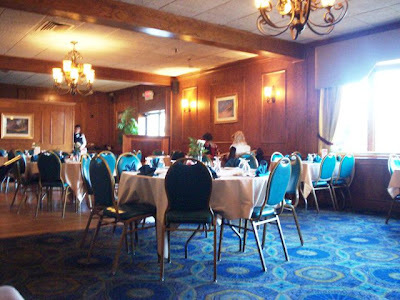 As we walked in around 3:45 p.m., we noticed that there were only a few couples scattered in the booth area, and only one party seated in the table section. After asking us if we'd like a table or booth, and some slight confusion about who would be walking us to the table and where we would be sitting, the hostess finally brought us over to a small table with four wooden chairs and topped with a white tablecloth. It was also topped with hard, clear plastic which was probably placed there to protect the tablecloth. The hostess left us with two thick green menus that we started browsing through almost immediately. Our waitress soon came over to greet us. Her name was Charlene and she was extremely friendly and polite. She took our drink order (two Diet Pepsis) and informed us that the list of specials were on the table in a little plastic stand. It didn't take long for Charlene to reappear with our drinks, which came in blue plastic Pepsi glasses along with two straws. Because the menu was so vast, Mom and I needed another minute. Charlene politely walked away so Mom and I could make our decision. Believe me, there was a LOT to choose from. There were very large sections devoted to both steaks and seafood, and a long list of appetizers, salads, soups, sandwiches, pasta, poultry, and desserts. 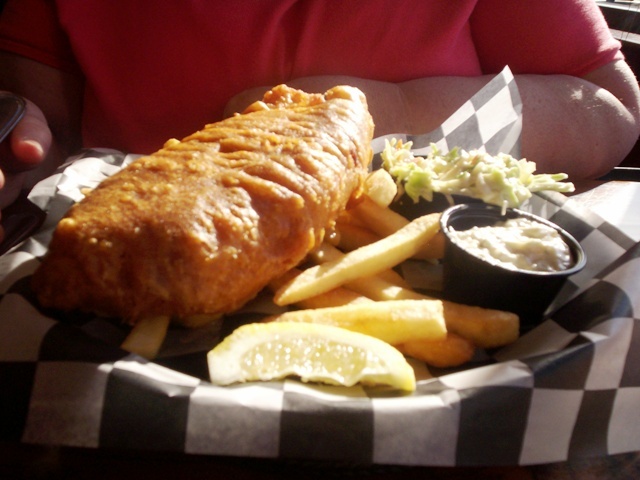 McGovern's also has a list of daily specials and some area favorites like meat pies, shrimp Mozambique, chicken chow mein (Wednesday-Friday), and fish and chips. 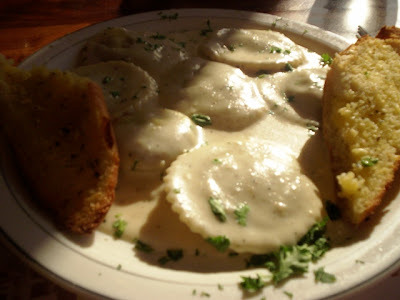 Some of the old-fashioned favorites include Yankee pot roast, pork chops, veal parmigiana, meatloaf, and both grapenut and bread puddings. Charlene timed it perfectly because as soon as she returned to the table, Mom and I were ready to order. I went with the baked stuffed fillet of sole ($9.95), while Mom chose the house special boneless fried chicken ($9.45). Charlene asked Mom if she wanted all white meat, and she did. That was $1 extra. With my meal I had cole slaw and fries for my sides, and Mom had the mashed potatoes (no gravy) and corn. Charlene asked us if we'd like some dinner rolls, and we took her up on the offer. She quickly brought them over while Mom and I checked out the interior. This place just screams "welcome home." You really do feel like you're dining in familiar territory, even if you'd never been here before. 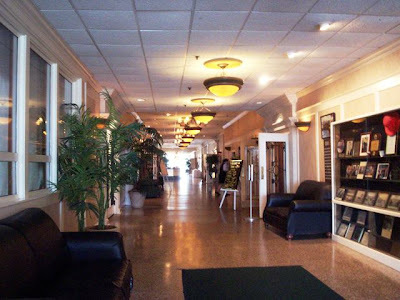 There were tapestries hanging on the wall, a dark, cozy fireplace near the booth section, chandeliers, light woods, plants, paintings, picture frames, and dark green rugs that made everything feel very relaxing. The entire staff was wearing uniforms, which I appreciated as you really don't see that much anymore. There was also a large wedding party having their reception in the back rooms, so everyone was really on their best behavior. There were lots of busboys bringing trays of dishes back to the kitchen, and everyone seemed to be in a really good mood. It was great! 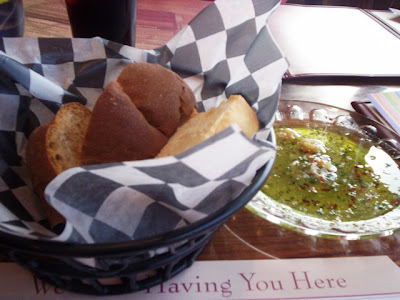 Before we knew it, our food was being carried over by a young male server who was accompanied by an older waitress. I don't even think we waited 15 minutes - perhaps not even ten. The older waitress stated that she "didn't know what happened to our waitress," but she was going to try and do her best to put our food down. She was hysterical without even knowing it. First, she took one look at my fish and said, "What is this?" I explained that it was the fillet of sole, and she plopped it down in front of me. Then she looked at my mother's chicken and said, "What is this? Pork chops?" I laughed and said that it was chicken, and she said, "OK ..." and put it down in front of my mother. Then, when it came to divvying up the side dishes, she told us that she was just going to put them all down in front of us and we could take whichever ones we had ordered. It didn't seem like she had the time to stand there and figure out who had the corn, but we loved her anyway. As she was almost done placing everything down on our table, Charlene reappeared to check to see if our food was ready. She was surprised, much like we were, to see that it had already arrived. Mom's chicken was amazing. It had a light, crisp coating, and the chicken itself was very moist and well done. There were a half dozen pieces of chicken, and she somehow managed to score two sides of mashed potatoes. You could tell that the potatoes were definitely homemade, and she said they were delicious. 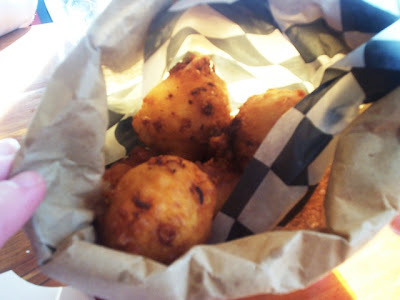 The corn nibblets were also hot and fresh. Mom said that her whole meal was outstanding, and she was very impressed. She mentioned that McGovern's had certainly improved since she had last visited. The meal also came with a boat of gravy (although she didn't want any) and a side of cranberry sauce. My dish was out of this world. 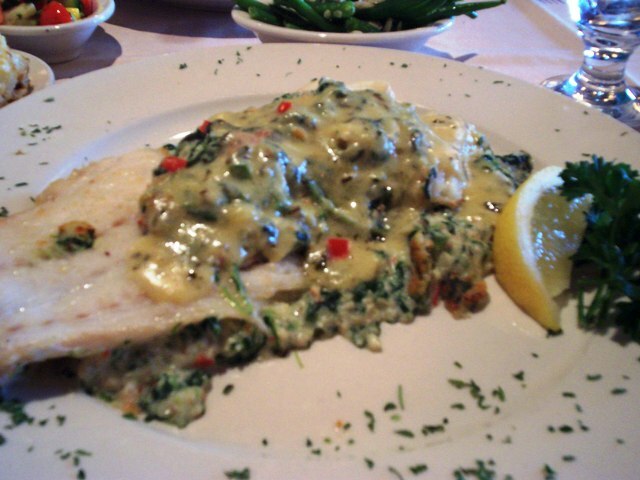 Not only were there two huge fillets of beautiful white sole, it was stuffed with a tasty bread stuffing and baked in a thick cream sauce. It was also lightly breaded and served in a small casserole dish. This was a huge portion and I stuffed myself full because I didn't want to leave a single piece behind. My meal also came with large French fries and fresh cole slaw. There was already a bottle of ketchup on the table for my fries, and this was certainly a lunch to remember. Charlene came over during the meal to ask how everything was. Of course, we said it was delicious. We also briefly talked about the wedding out back and the Shania Twain song that was being played. Charlene was one of those waitresses that you didn't mind if she came to your table to chat. She was really excellent. We left $30.10 on the table for Charlene (including 20% tip). She wished us well, and then gave us directions to the ladies' room after my inquiry. When we got back there (we had to follow a lot of signs), we saw a special "Bridal Room." I'm guessing this is where the brides get ready - or go to the bathroom - before their reception. The ladies' room was beautiful - very clean and neat with many stalls and sinks. As we left, I thanked Mom for recommending this place and starting our "Tour of Fall River" off with a bang. The lunch that we had at McGovern's definitely overrode every stale ham and tuna salad sandwich that we've ever had at one of their banquets. They also have a huge take-out window, and I can definitely see why this is needed. The food is excellent, the restaurant is popular, and you should really be ashamed of yourself if you live in the city and haven't been here yet. It's a gem! P.S. 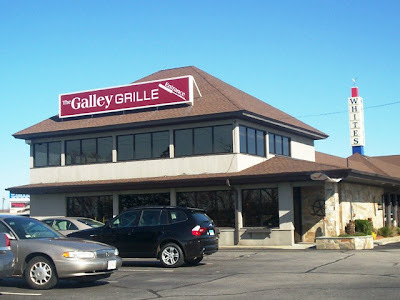 - My friend, Melissa, just reminded me that this is one of the only places around that serves corned beef and cabbage. She loves this place! VERDICT ................Based on multiple visits to each place I'd have to choose VENUS as being the best over-all restaurant experience . It's just so elegant and gracious and the food is to die for ....and really ....that's what makes a restaurant .....the food . Everything from soup to nuts , including some very famous dishes , is outstanding . I actually get excited when I know I'm going there . LOL To me both WHITE'S and MCGOVERN'S are more family type restaurants with family type meals ....although maybe better food than Mama's .....LOL. But VENUS is on another level . Of course this is just my opinion so feel free to disagree and let us know which YOU prefer . It's not a fight . As I said .....there's a reason all have been in business so long .....they're all terrific .I've been to many weddings at VENUS ........many functions , bereavement breakfasts , showers and parties at both WHITE'S and MCGOVERN'S and all were so professionally handled . All 3 of these places will be around for years to come . And we're grateful for that .